2014-07-16 – The President of the Port of Brussels today inaugurated Great Organ, an artwork created by Philippe Van Snick for the façade of the TIR centre on Avenue du Port. The ceremony was attended by the artist. 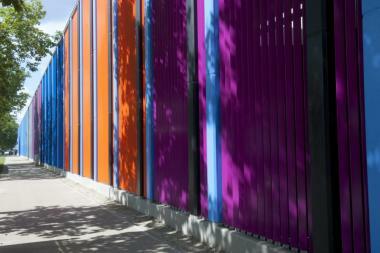 Great Organ is a monumental work, 150 metres long, consisting of coloured aluminium sections. 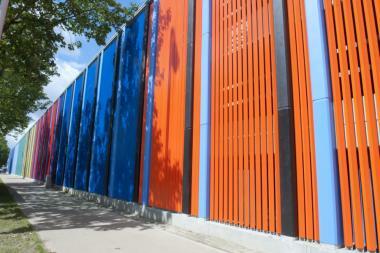 It covers the TIR centre’s east façade. 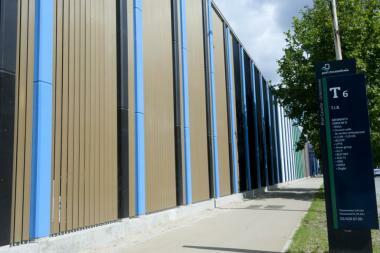 The TIR centre, built in 1958, has 160,000 m2 of warehouse space. Located close to the motorway network and just 5 minutes from central Brussels, it is used for customs clearance for goods and for storage, logistics and urban distribution. 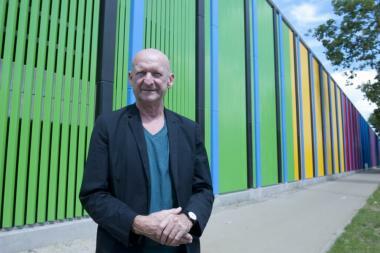 The installation of Philippe Van Snick’s artwork is one element in the extensive overhaul of these buildings, which also includes the renovation of the façades and the repainting of the loading/unloading areas. These changes demonstrate the desire of the Port of Brussels to integrate its facilities as effectively as possible in their urban setting. 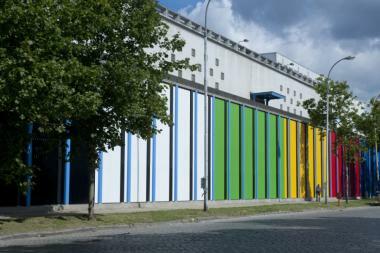 The renovation also marks the essential role played by the TIR centre for urban distribution in Brussels. The Port intends to step up this role over the coming years, in collaboration with Brussels Mobility, which has drawn up a Strategic Freight Plan for the Brussels-Capital Region.